Did not make the commute to work this morning. Woke up feeling tired and lazy. Even a blue sky could not get me on the bike. I did have a lot on in work today and would feel under more pressure if I cycled in. 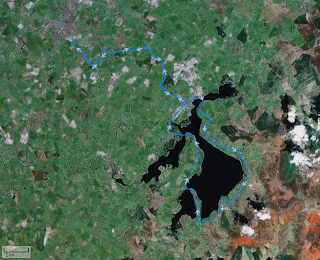 So decided to just get out on time and do a spin around Blessington lake. Got home, stuffed two bananas and jaffa cakes in my mouth and was out the door at 5:20pm. I was on the Be One as the Giant's rear wheel was still in the shop. The fact I only had the Be One probably did not help motivate me either, but once I got moving I could not believe I went almost 3 and a half days not on a bike! It took me 1:40 mins today. Probably my fastest time. At the start of the year it was my long distance training loop, now its my high tempo spin - its great to see progress! Tomorrow, I'm leading a fun spin around Djouce. The forecast ain't looking too good, but we might sneak in a couple of hours.